Salisbury Steak was named after James Henry Salisbury, MD. was a 19th century American physician, and the inventor of the Salisbury Steak. Salisbury was born in Scott, NY, in 1823, died 1905. He earned a Bachelor of Natural Sciences degree from the Rensselaer Polytechnic Institute in 1844. He joined the New York Geological Survey as an assistant chemist, was promoted in 1849 to principal chemist, and remained in this position until 1852. He earned his medical degree from Albany Medical College in 1850, and a Master's degree from Schenectady College in 1852. The Salisbury steak, his means of achieving this goal, is ground beef flavored with onion and seasoning and then deep-fried or boiled, and was introduced in 1888. Salisbury believed that beef was excellent defense against many different physical problems. He suggested that Salisbury steak should be eaten three times a day, with lots of water to cleanse the digestive system. He was an early American proponent of a low carbohydrate diet for weight loss, and he promoted his diet for that purpose. Salisbury steak, essentially a hamburger, might have faded from the collective memory if World War I had not inspired a drive in English speaking nations to rename Germon sounding thing. 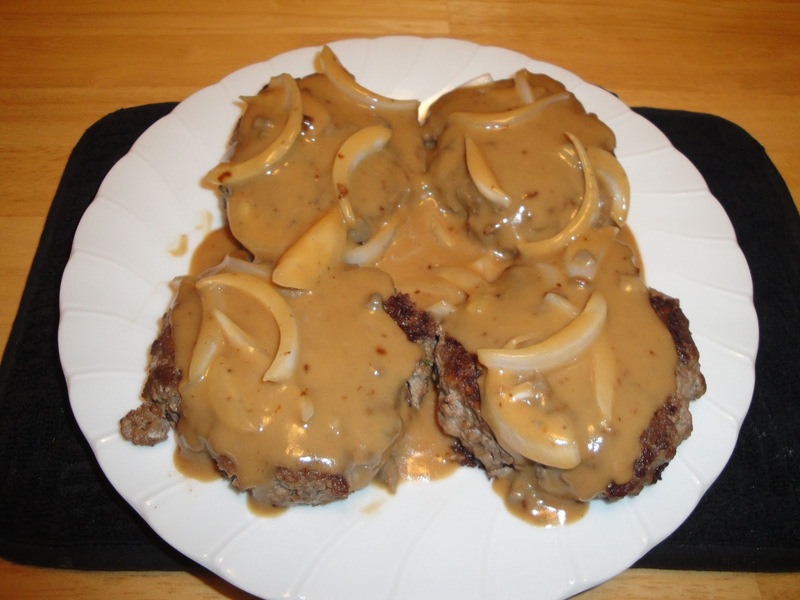 Salisbury steak became a popular substitute for the bunless hamburger. In a large bowl, add meat, bread crumbs, egg, Worcestershire sauce, crushed red pepper, salt and pepper. Using your clean hands, combine ingredients. Shape into 4 patties. Cook brown gravy according to package directions. In a large skillet, heat oil over medium heat. Cook patties about 10 minutes, or until no longer pink in center, turning once. Remove patties and keep warm. Turn heat to medium low heat. In the same skillet add brown gravy, cream of mushroom soup and onions, stir well, heat through, about 7 minutes. Serve gravy and cream of mushroom soup over patties. Enjoy! This sounds great! I've been looking for a good recipe for Salisbury steaks. My husband loves them!! Thanks so much for sharing! Hi Paper Plates and China Recipe blog, I think you will like this as much as my family did. If you try this recipe, let me know what you think. Hi Kecker, I remember eating salisbury steak growing up, but my mom called them "poor mans steak". :-) Love it. Great information on James Salisbury. I didn't know the origins until now. I remember the TV Dinners also. Salisbury steak was considered the cheap version of a steak. Yours look great! Dr. Salisbury would be proud! Hi Christine! I am not sure if I had Salisbury Steak before...I could have it without knowing it is (high likely). I love sauce with Worcestershire sauce in it. This looks delicious! Salisbury was the first Atkins! An excellent looking steak! I enjoyed reading the history, thanks! I love salisbury steak, but isn't it interesting that he was advocating against vegetables? We've come a long way, baby! I honestly think the only time I have had salisbury steak was as a tv dinner as a kid. I used to love it so I could only imagine that homemade is way better. I have had this steak before but not the delicious gravy you have here. I am sure it makes all the difference-delicious. Have a great weekend! That looks sooooo good!! I haven't had salisbury steak in years... it's time to change that! Hi Gera, thank you so much! Have a good weekend. I will cook this soon.. yum! This brings back memories of my Dad. He loved this. Hi Christine, that sounds yum and love the great history lesson. Thanks. This was one of my favorites growing up, and I haven't had it in years. Looks SO good! The sauce sounds wonderful! I haven't had it before but I like having creamy mushroom sauce for my steak.